I don’t know why this package called out to me so strongly, but it did. But looking closer, I do know. It’s their damn marketing. “Fruity and Crunchy!”. Crunchy? I thought about it. Yes. HELL YES. I want a crunchy jelly bean. A crunch on the exterior, giving way to a standard jelly bean consistency? 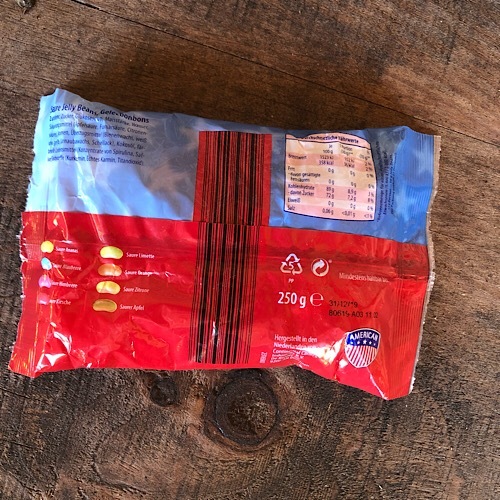 Using German flavors and ingredients trying to emulate “American” jelly beans? All of this worked for me. I was still doing the boiled sweets reviews when I got these, so they were sitting, staring-nay, leering-at me for weeks. Finally, it was time. Relatively standard flavors here (listed on the bottom left), with some standouts like pineapple. Pretty standard looking stuff. Time to get to it. First impression: crunch? No crunch. Not even a hint of a crunch: these are exactly the same as every soft jelly bean you’ve ever had. That’s not such a terrible thing, but man was I let down. But then I chilled, and just tasted. Where was the sour?? Ahh….there it was, creeping in, and developing the flavor. Yummy. The flavors are actually quite good, and at the end of the day, I liked these a lot. But would I buy these over sour Jelly Bellies? Probably not. The promise of a crunchy bean was too much for me to get over, apparently. So now I’m searching for it. If anyone out there knows of a tart/sour jelly bean with a crunchy exterior, hit us up and let us know, I’d love to scratch that itch. 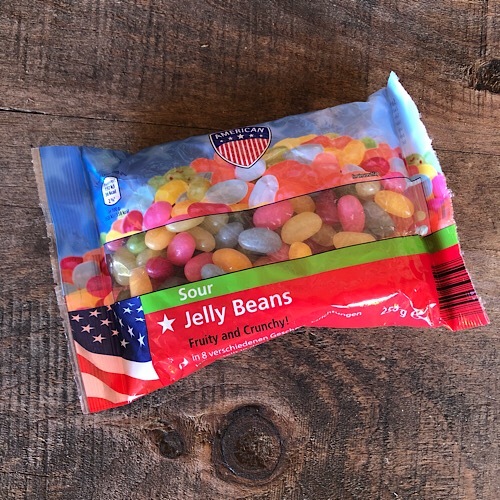 As for these “American Brand” beans…I judge them as a quality candy. Not worth pursuing, since we happen to do jelly beans quite well here in the US though. Very cool to know! And honestly…the more I eat these things, the more they’re growing on me! You want crunch? The Nerds jelly beans are what you’re looking for my friend. uhhh YES!! How do I get these in my life? They don’t seem to be available…. 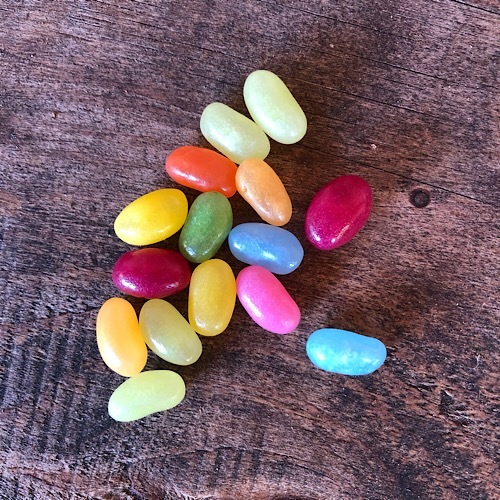 Nerds jelly beans generally make an appearance with the Easter candy at Walgreens– though not all Walgreens are equal when it comes to candy. If you ask in advance, they might be willing to order them for you.